2.MATERIAL: NON-TOXIC freezable plastic ice packs in BPA free PP.Safe grade plastic material for drinking and food.Feel free to use it. 1.Clean up bottles before use.Fill any drink you want then put it in freezer for hours.When you go out,take them with you. Keep food fresh.Besides you can drink whatever you fill in when it’s melting.Ice pack & water bottle 2 in 1 functional cool packs. You deserve it. 2. 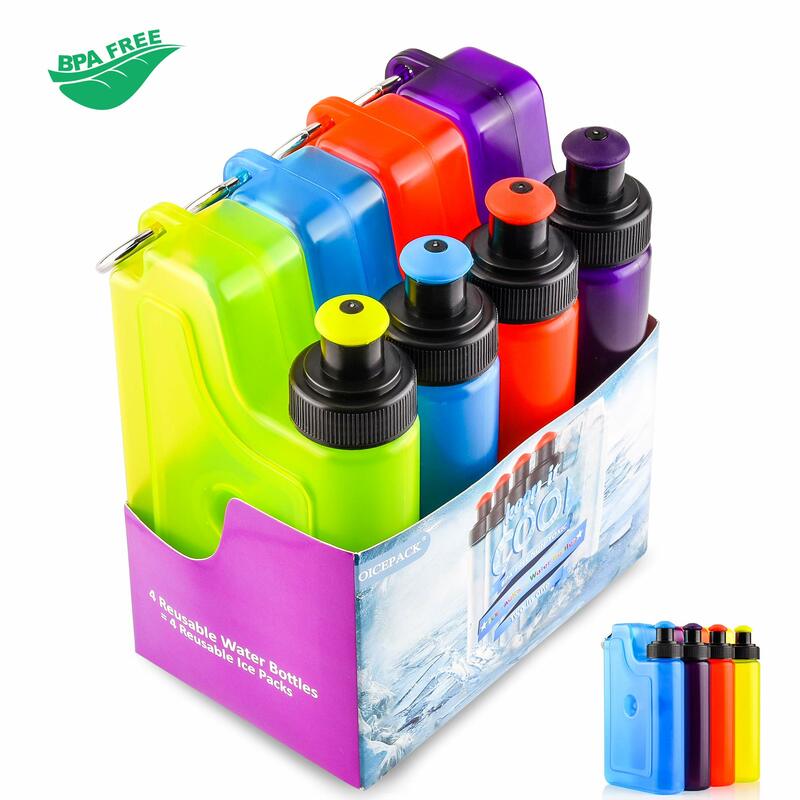 Super handy bottle ice packs are suitable size fit perfectly into all types of lunch boxes, lunch bags, and coolers.Bottle comes nozzle lid,once ice melted you can drink water or juice inside easily. 3.Essential tool to keep your food cool in your lunch box at school or office,Great for various outdoor activities as well.Such as Hiking,Picnic,Camping, and so on. A product more than ice pack. 4.ECO-FRIENDLY: Reusable bottle ice packs dishwasher safe, resistant to high temperatures. Means it’s ok to hold hot water also. Great value pack. You get more than what you pay for. 5.FUNCTIONAL: Refillable empty water bottle ice packs,You can drink water or whatever drinks you fill in while it’s melting.Get two birds with one stone.Excellent for traveling and outdoor activities. Multi-functional ice packs,you deserve it.Come with stainless steel key ring. Perfect for back pack or waist bag.Convenient for running or hiking etc.